Since the Chinese starting grafting, thousands of years ago, it has become the prominent way that we propagate fruit trees. When you purchase a named variety fruit tree, it usually has been grafted, especially apples, cherries, pears and plums. Since most plants are cross-pollinated, their seed does not come true to the parent. Just like humans, seed contains genetics from both contributors where you never know exactly which genes are going to be prominent. This is great for genetic variety, but not so great when you want to have an edible fruit. This is why grafting is important, it allows us to know exactly what fruit will be produced. What is grafting? 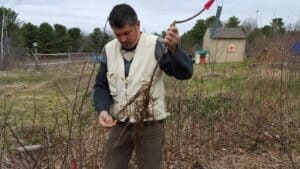 Grafting is the act of taking a bud or stick (scion) from a known variety of fruit and joining it with another tree, usually called a rootstock. There are many ways to graft, whether by bud insertion or by scion joining, but the end result is the same. You get the fruit you are desiring. What do I need to know about my grafted tree? The grafted location on your tree is sometimes visible, sometimes not. You may see the bump or notched location about 4 to 8 inches above the soil location on the tree. The most important time to be aware of the graft is in cases of a tree that has been broken or eaten. 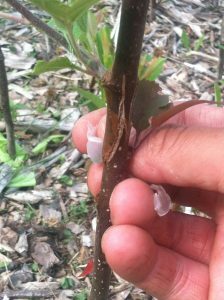 If the break is below your graft, your tree is now just rootstock, but don’t worry, it can be grafted again. If it is above the graft, you still have your variety and, with care, the tree may grow just fine. Does the graft affect my fruit? It will, the rootstock and variety both influence when the tree will produce fruit. A dwarf tree will produce fruit earlier; in rootstock terms, we refer to this as the precocity of the tree. Your variety also affects how fast the tree grows and how early it will produce fruit. Disease resistance is affected by both rootstock and variety. If you’re interested in early fruiting varieties and rootstocks, feel free to contact us for recommendations. 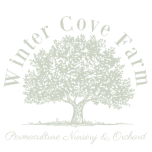 Here are Winter Cove Farm we graft all of our trees except for ones referred to as seedlings. The seedlings we offer have good varieties of fruit within the genetics although there will be variations among them. Your grafted trees will produce the fruit they are named. Our rootstock options include hardy varieties from Geneva, NY and the Krasnodar Region of Russia. We only offer varieties and roots that have proved themselves on our orchard. 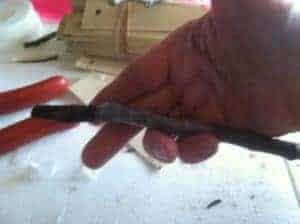 Would you like to learn how to graft? We share grafting skills in our $100 Orchard Class and our Grafting New Fruit Trees Class that happen every spring.